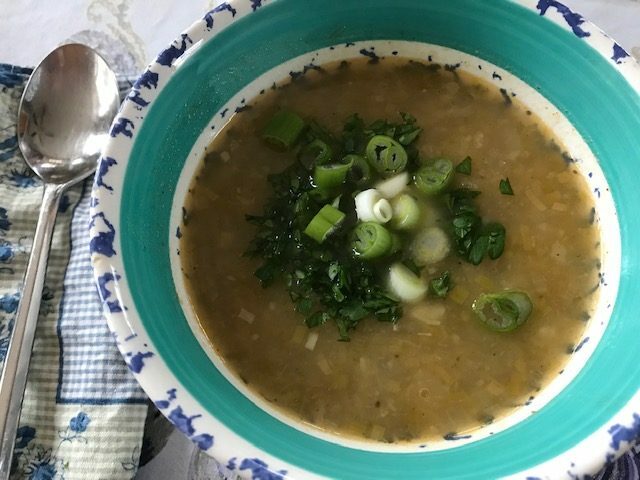 Posted on 11 January 2019, in Cook The Book Fridays, Everyday Dorie, Soup and tagged alliums, Cook The Book Fridays, Everyday Dorie, potatoes, soup. Bookmark the permalink. 11 Comments. Your soup sounds delicious! I like the idea of corn stock. I’ve never made it but will try to remember it this summer. 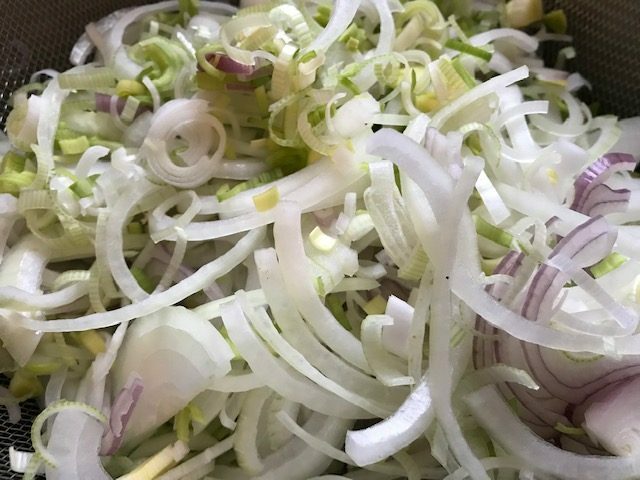 And leeks from your garden? I’m quite envious. Leeks are so expensive here and so tuff I end up tossing half of the layers. I often say I’m not buying them again but then I love their delicate flavor so I weaken. Soup is a hard sell in my house but this one received positive reviews all around. I already had cooked bacon in the fridge so I used butter to cook my onion mixture- I don’t think anything suffered as a result. Your soup looks delicious! The addition of corn stock sounds good. Love the flexibility of this recipe, using whatever veggies we have ! This was the perfect recipe for this winter weather and yours looks very delicious. I like the sound of corn stock and old bay, I’m sure it was fantastic. I loved the clear look too! I’ll be making up another batch of this over the weekend because YUM! I love your tweaks to this soup. Yum! i used old bay, too…yummy. this was a great lunch or dinner soup! I am so impressed by all of your ingredients that you had on hand that you grew or saved yourself! I apparently need to get back with it! Stock from corn cobs! Your soup sounds amazing! I bet that corn stock tasted so wonderful on a cold winter day! All of it together sounds quite tasty and I love how versatile the soup is! Love the reference as a “backpocket recipe”. Perfect ! Yes, this was a winner no matter how you sliced it but I am really intrigued by the Old Bay. That with the bacon fat combo sounds like an amazing way to add flavor and I will definitely be giving that version a go. Kudos on the eating less decadently. I started eating better with this one but managed to hit FLOUR bakery before we left Beantown and was remarking to Pete that the Kouign-Amann was one of the best things I have ever eaten. SWOON. Now back to soup for a while…..
With all the rich foods during the holidays, all of a sudden a brothy soup has become my craving. I like to lighten the chowder by not overdoing the cream. Dorie’s recipe allows us to find the balance with the creamy texture. Corn with old bay reminds me of summers by the bay. That’s next on my list.